I saw this abstract art at the Brooklyn Museum. While Hammons first presented his art in the 70’s for many reasons outside of environment awareness, I think abstract art using any type of bag now is needful. I got a text from my sister instructing me to start a project with my students using just plastic bags. I am at the Brooklyn Museum viewing Soul of a Nation: Art in the Age of Black Power and behind me is an installation view, by Washington D.C. based artist Sam Gilliam. It’s called “Carousel Change”. I love installation art. When I saw this piece, I thought about The Gates by Christo and Jeanne-Claude. I read an article on Mnuchin Gallery’s page and found that Gilliam got the idea to paint canvas and hang it as oppose to framing it, from watching women in his neighborhood hang their clean laundry. 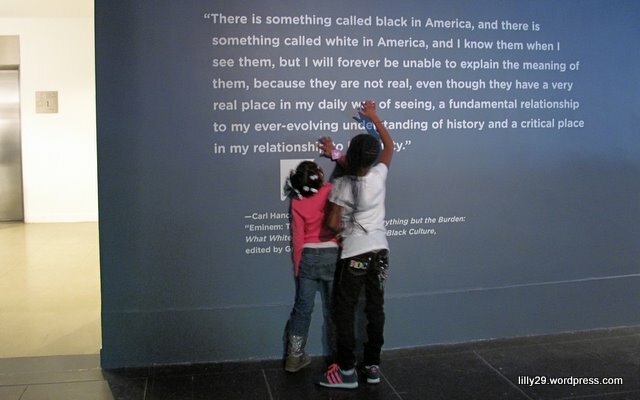 On Thursday I took my little brothers to the Brooklyn Museum to view and hear Question Bridge: Black Males. This exhibition was put together by artists Hank Willis Thomas and Chris Johnson in collaboration with Bayeté Ross Smith and Kamal Sinclair. I am glad I went to the exhibit. I am now able to understand African American males a little more. Just because I am African American doesn’t mean I fully understand what my brothers are going through. I think they have to put up with things like racism a little more than their sisters. Not only did I walk away with a better understanding of my brothers but I also walked away feeling empowered. Listening to the dialogue and having certain questions answered by men from all walks of life brought a type of energy in the room, a feeling of being satisfied about who I am. I would suggest this exhibition to anyone from any race, male and female. Sometimes when you learn things about others, you learn things about yourself.